We’ve seen the #The2ndComing going viral thanks to @DayLiteLED and @TalonOOH, Fulham sell an extra (last minute) 1,000 tickets to a local derby match using Amscreen and here we see more football related DOOH news, again with the Amscreen network. 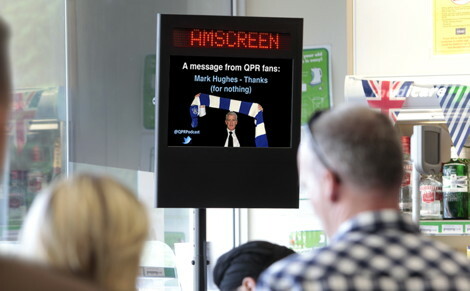 Football fans @QPRPodcast reacted to the news of Mark Hughes’ appointment as new Stoke boss by paying for a cheeky advert at a local petrol station (close to Stoke’s Britannia Stadium). For the uninitiated in these shenanigans; Mark Hughes joined the football team Queens Park Rangers (as Manager) in January 2012 helping then retain their Premier League status in 2011–12, next season however, (in the summer of 2012) Rangers began the 2012–13 season in terrible form and Hughes was sacked on 23 November 2012. Under the leadership of another manager, Queens Park Rangers (QPR) were relegated that season (i.e. just recently). Mark Hughes was recently appointed manager of Stoke City (30 May 2013) – QPR will play next season in the second tier of English football, whilst Stoke City will play in the top tier, The Premier League. This entry was posted on Monday, June 3rd, 2013 at 10:02 @460 and is filed under DailyDOOH Update. You can follow any responses to this entry through the RSS 2.0 feed. You can leave a response, or trackback from your own site.